The 2004 tsunami that devastated the lives and livelihood of several people in the state was the beginning of a journey for filmmaker and journalist R Revathi and her friends. Every now and then, we come across a teacher who goes beyond the call of duty for their students. 'Teachers Who Transform' is TNM's five-part series, honouring the teachers who go the extra mile to understand their students, their unique needs and difficulties, and provide them with education that goes beyond academics. This is the first story in the series. This common, most simplest of sayings summarises the purpose of education in a nutshell. Teaching is a noble profession, one that involves immense patience, perseverance and kindness. While ‘education for all’ might be an idealistic, ambitious dream, the challenge lies in extending this circle to include children coming from all walks of life. Most often, engaging children from marginalised communities is a challenge that goes beyond just perseverance and kindness. It calls for a resolve stronger than the strongest of waves powerful enough to alter terrains. It was one such wave that has forever changed the lives of a few children in the Nagapattinam district of Tamil Nadu. The 2004 tsunami that devastated the lives and livelihood of several people in the coastal areas of the state was the beginning of a journey for filmmaker and journalist R Revathi and her group of friends. The Vaanavil school was started in the year 2005 at Keezhakarayiruppu village in Nagapattinam. The story of how it all began can be traced to the 2004 tsunami. A curious Revathi, who was volunteering along with her friends in Nagapattinam, one of the most severely hit districts in Tamil Nadu, followed a child begging on the streets when food was available in surplus. This nomadic tribe was not considered to be a part of the fishing community in the district and hence ended up living outside the margins. Vaanavil, in that sense, was started specifically for children coming from this nomadic tribe. Today the school also has children from other tribes like Narikorava and Irula studying in it. It was, however, a huge decision for the community that always lives on the fringe to accept help, shares Revathi. “A child today can earn Rs 500 from begging, back then it was Rs 300. If you had three children you’d earn Rs 1000 – which was not an easy amount to forego for them. Therefore for the community to agree to support Vaanavil was a huge decision,” she explains. The school that was started with just a handful of kids today has 174 students. Murugammal, who was less than 10 years old when she led them on this journey, has now joined the team as a teacher, having completed her DTE (Diploma in Teacher Education) in 2015. A teacher stands near the blackboard in the sunlit classroom, acting out syllables like in charades. The children mimic her actions, joining syllables together to form the words – Man, Milk, Band are called out loudly in chorus. This guessing game is a way to help children learn spellings and phonetics better. On the ground floor is a Montessori classroom for children between ages two and six. Blocks are heaped one above the other to form tall towers, patterns are cut out from rolled out dough and colourful seeds are separated from a mix. With the help of the Ram Charan Trust, teachers at Vaanavil were trained in the Montessori way of learning only a few months ago. “They were kind enough to come here and train our teachers,” adds Revathi. Lessons too are taught using the most unique methods. The teachers choose an element for the term and all concepts in mathematics, science, history and so on are explained with the help of this element. For this term, the chosen element, water, was evident from the classroom walls – charts of colourful fishes doting the blue of the sea, algae swaying underwater, coral reefs in different shapes, etc. decorate the walls. But more than innovative methods used in teaching, it is through food that they hope to sustain the students’ interest, says Revathi. “When we first began Vaanavil the children were terribly malnourished. So is the case with everyone in such nomadic tribes. The pregnant women do not get nutritious food, they usually make fish curry and rice, and the children are born malnourished. Our biggest goal, therefore, was to make sure the children are well-fed,” she says. 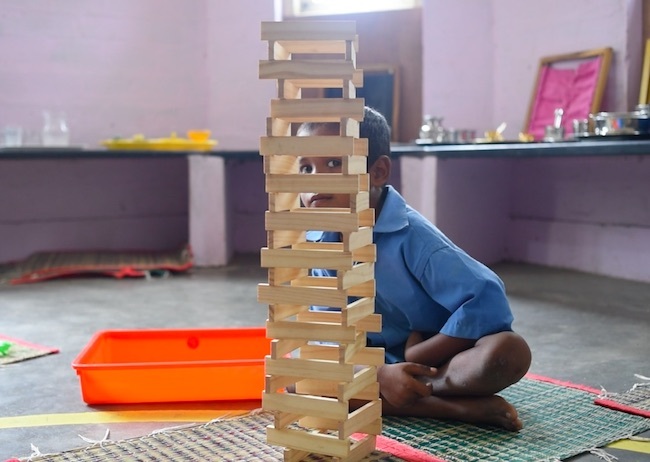 At Vaanavil, great care is taken to make sure children eat nutritious food and so this residential school that comes under the state’s Sarva Shiksha Abhiyan scheme provides all 174 children with three square meals a day. “We have been able to bring down malnourishment among children significantly and that has been our biggest success,” smiles Revathi. “At Vaanavil every decision is made in consultation with the children. The name in fact was decided by them. So is the case with the food. However, we make sure they get tasty and nutritious food. If they ask for pakoda, we make sure there’s something with ragi on the menu to make sure they get a balanced meal,” shares Revathi. The relationship the children share with the school goes beyond classroom walls. Shalini, the school’s principal, shares that quite recently they had to run from pillar to post trying to secure Aadhar cards for the children. “They come from families that do not even have one identity card. You think they’ve got bank passbooks? It has been an arduous journey bouncing from one officer to another requesting for their help,” she says with a weak smile. 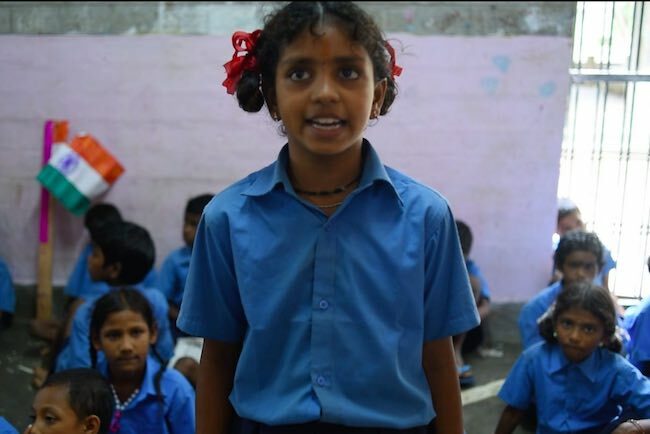 With her hair plaited and folded in two with bright red ribbons, Gowri stands in front of her class to recite the lines she’s memorised as part of her Independence Day speech. “Honourable guests, respected teachers and my dear friends. Today we’re gathered here to celebrate our Independence Day. Independence Day is our national festival,” she says with a look of concentration before breaking into a shy grin. Gowri, who is a resident student at Vaanavil, shares that she travels home to Srivanjiyam (about 35 km from Vaanavil) during the weekends. “Sometimes if I talk to Amma over the phone, I stay back at the school itself,” she smiles. Gowri, we learn, is the daughter of Vaanavil’s oldest student Maari, who dropped out after a brief period. Evidently, the biggest challenge faced by Vaanavil is the dropout ratio. This, however, is quite understandable given the ways the children’s families survive. Most often, children begin selling plastic wares or begging which fetches the family good earnings. Therefore foregoing their earnings by letting their children study is a big decision which takes a big chunk out of their livelihood. As someone who dropped out of Vaanavil after Class 8, Saminathan has a story of ‘not-like-me’ to share with the present generation. “I was forced to work for the family after completing Class 8 because of our financial situation. I don’t blame my parents. Also, it was getting difficult for me to cope in the government school, so I relented,” says Saminathan. Working with a silk saree company today, Saminathan travels for hours in the searing sun to feed his family of four. He now understands the value of education. “Both my children, Dinesh and Harish, will continue their education. I have dreams for them, to become a doctor and engineer,” he says with a look of seriousness in his eyes. Vaanavil’s first graduate Lakshmi passed out in 2015 after completing her BA in Economics. After working with Vaanavil itself for about a year followed by a short stint with Samsung, she has decided to pursue her education further. While Vaanavil has 90 students studying from Class 1 to 5, the rest are sent to a government school in nearby Puducherry for higher education. The students are housed in Vaanavil itself and commute to their school or college. As the minivan enters through the gates in the evening, a bunch of older students scurry down from the vehicle to be greeted by the resident elementary school students. It is evident that some of these students are treated with respect and admiration by the younger ones. P Sudha is now in her final year of Engineering, studying in Thirukuvalai, a half-hour drive from Vaanavil, and is a source of great inspiration for many at the school. The school also has other aspiring stars. Dhanalakshmi is pursuing her BA History from ThiruViKa College in Thiruvarur. Two other students, Meena and Selvarani, are studying in two renowned colleges in Chennai – Loyola and College of Arts. A few boys too have weathered elementary school and entered high school for the first time in the 13 years of Vaanavil. “Don’t you want to know what we want to become?” Class 11 students Aarthi and Selvi pipe in as we are talking to Sudha, the enthusiasm in their eyes catching us off guard. “We’re going to become IPS officers,” says Aarthi, bursting into laughter along with Selvi. And with that we know Vaanavil will keep spreading its colours.